The good quality of light at the right time of day improves the feeling of well-being and intellectual performance. 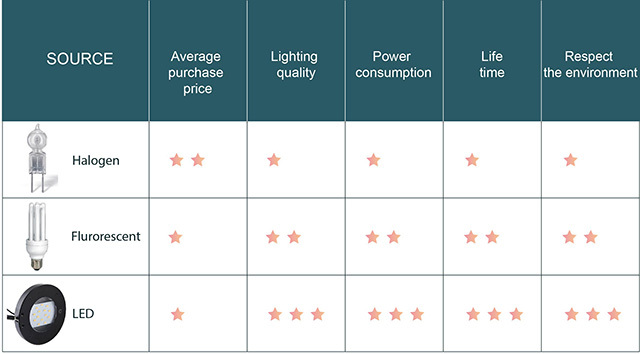 1.How to choose your desk lamp? The Industrial Medicine recommends a lighting of 450 Lux minimum. The European standard NF EN 12464-1* even up to 500 Lux for on-screen or reading work. It should be noted that an office equipped with fluorescent ceiling lights generally receives 200 to 300 Lux! Local lighting is therefore essential to work under acceptable conditions. The length of the arm also affects the quality of the illumination: the head of the lamp should ideally be 40 cm above the worktop. We must therefore avoid lamps with arms too short. What type of bulb ? Fluorescent lamps, commonly known as fluorescent tubes or neon tubes (although they do not contain neon), have a tube shape in which light is mainly emitted by layers of luminescent substances excited by a discharge electric. LED lighting is very efficient and offers remarkable power and energy. The service life is 50,000 hours and they do not contain mercury and light up 100% as soon as it is turned on. We spend 90% of our time indoors, And about 8 hours a day at our workplace. The light acts essentially on our biological clock, making sure that we sleep well, that we stay awake during the day and that we are at the best of our performances. However, in our modern world, we rarely go out outside and in the absence of sufficient daylight, our internal biological clock is deregulated. Fatigue, insomnia, and depression can be the result. Even a sufficiently lit interior is often perceived biologically dark and does not regulate our internal clock. A biologically effective artificial light can compensate for this deficit and stabilize our biorhythm. The internal biological clock is a powerful control center By penetrating the body through the eyes, light plays a fundamental role in the regulation of circadian rhythms, that is to say those which are spread over a period of about 24 hours (awakening-sleep, variations of Body temperature and hormonal levels, meals, etc.). Approximately 80 percent of the information is transmitted through our eyes. Thanks to the retinal glands in the eye, we also treat non-visual information. 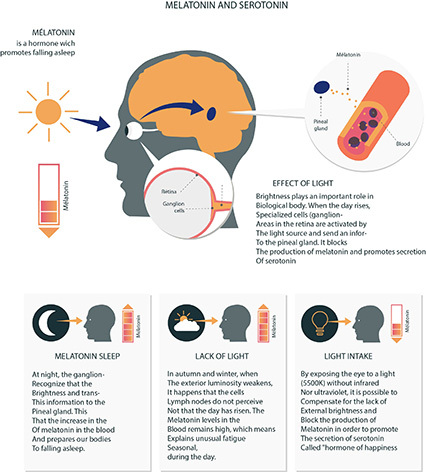 Influenced by the color of daylight, these cells control the secretion of serotonin and melatonin hormones in the brain, thus regulating our circadian rhythm (day and night rhythm). Melatonin makes us feel fatigue and reduces our activity; Serotonin, for its part, affects our mood and our dynamism. How to optimize its circadian cycle! Variations in lighting in terms of temperature either cold (color blue 5500K) or warm (color red2700K) during the day improve our well-being and therefore our performance. Since each person has their own biological rhythm, it is essential to disseminate optimal lighting adapted to the circadian rhythm of each user, by providing a personalized solution regulating his periods of activity and rest. A lamp has an apparent color of light. It is the color temperature that is measured in degrees Kelvin (K). The higher the color temperature, the colder the light (in blue) and the closer it is to the daylight. On the contrary, the lower the temperature of the color, the more “hot” (in the yellows and reds).